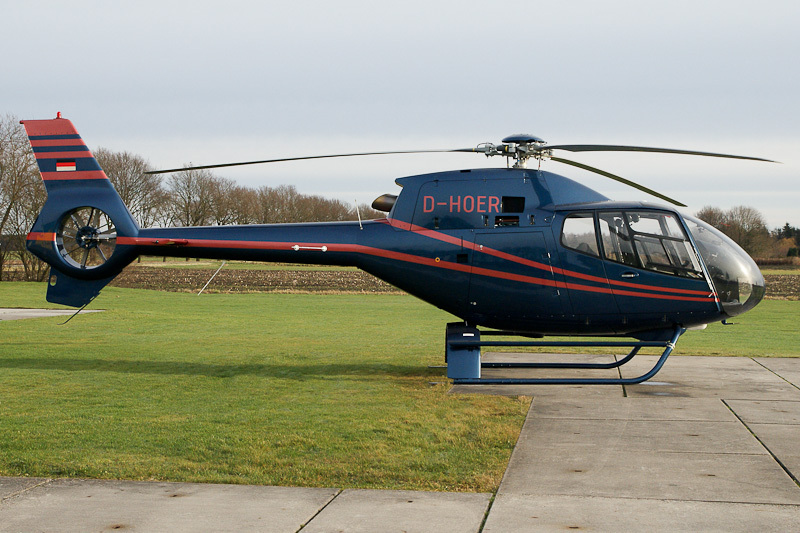 In 2001, Eurocopter EC120 B c/n 1203 was registered D-HOER with Fritz Brinkman and based at Oerlinghausen, Germany. On 26 August 2011, Eurocopter EC120 B Colibri D-HOER was amoung the helicopters of a private fly-in at the Hotel Weißer Bär in Mühlheim an der Mosel, Germany. The fly-in turned into a disaster as the tail end of storm "Bert" brought tennis-ball size hailstones, causing extensive damage to all 18 helicopters parked in the grounds of Hotel Weisser Bär. The 2001-built Colibri D-HOER was substantial damaged and was ferried for rebuilt to Heli Holland Technics in Emmen, the Netherlands. In February 2012, Eurocopter EC120 B D-HOER flew back to Germany like new after the makeover at the Heli Holland heliport. On 14 May 2014, registration D-HOER was cancelled as exported to Montenegro. On 4 June 2014, the Aibus Helicopters EC120 B c/n 1203 was registered 4O-VIP in Montenegro with Airways Montenegro.